"[Bartlet, MacDonald & Gow] offers character ... that feeling comparable to a handshake of an old friend, whose word is sound and whose sincerity has been proved." "Scotch in its inception, Scotch in its tradition but developed in line with the talent and personality of its younger Canadian associates, the business is representative of much that is soundest and best in our native character." 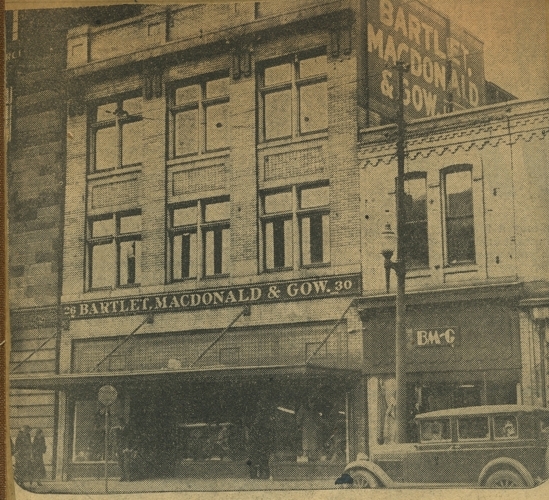 More than just a department store, Bartlet, MacDonald & Gow was an integral part of downtown Windsor's cityscape, serving local residents for more than a century before its demolition. 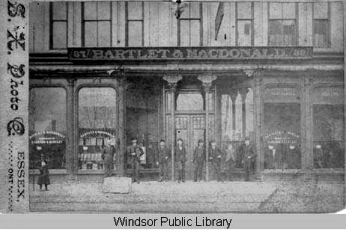 The partners of the firm were pioneers of the retail business in Windsor, ensuring that the store - which had become a hallmark of the downtown experience by the 1910s - grew and expanded with the city. 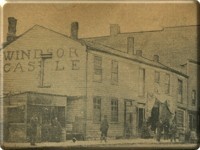 The operation began in 1860, when Donald Cameron, a native of Scotland, opened a general store on the southeast corner of Ferry and Sandwich (Riverside Drive) Streets next door to Windsor Castle Hotel. 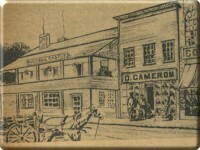 Customers were welcomed into the 600-square-foot establishment with a simple sign that read, "D. Cameron, Dry-goods." Less than two years later, Cameron entered into a partnership with another Scottish immigrant, John Thorburn. The new firm of Cameron & Thorburn commanded a total stock of $14,001, with Cameron's shares amounting to $7,934, and Thorburn holding $6,067 in cash. Sales averaged around $100 a day; on especially busy and rare occasions, they exceeded $200. They spent $20 a month on rent, and an additional $20 on advertising their wares, which included things like molasses, eggs, flour, coffee, and cloth. Customers could take advantage of low produce prices, but manufactured articles were priced correspondingly high. While staples such as eggs sold for 8 cents per dozen and coffee could be purchased for 20 cents per pound, cotton ticking commanded a remarkable price of $1.25 per yard. And unbleached cotton, which sold for 12 cents per yard in the 1930s, cost over four times as much in 1862 at 50 cents per yard. Given the high prices of merchandise obtained from factories, Cameron & Thorburn often bartered with the local farmers for their wares, accepting produce such as oats, shorts, and eggs for payment. Ashes were another negotiable farm product, which could be converted into potash. 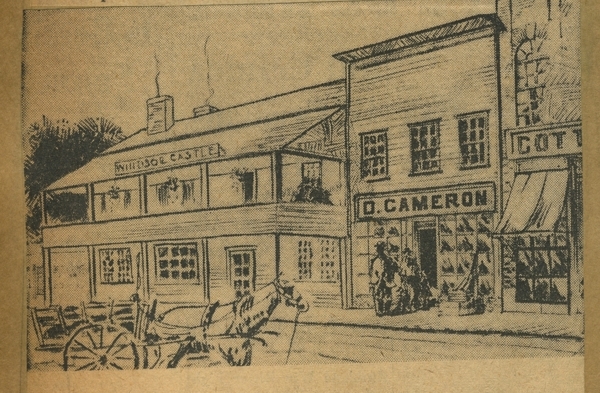 The partnership of Cameron & Thorburn thrived until 1871, when the store burned down in the great October, 1871 fire that consumed much of Windsor's business district. The partners temporarily conducted business in the auditorium of the old town hall while a new store was built atop the rubble of the old. However, Cameron reopened in 1872 alone, Thorburn having withdrawn to make a foray into the grocery business with James Gibson. Cameron carried on as sole owner until 1877, the year of great economic panic on the North American continent. While other companies were collapsing, Cameron was expanding, and took George Bartlet, an Amherstburgh native and a senior staffer who had been a bookkeeper with the firm for fifteen years, into partnership. The firm, which now operated under the name Cameron & Bartlet, continued to enjoy success for another decade before Cameron decided to retire and return to his native home following a serious illness. 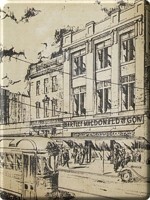 He transferred his interests to Colin MacDonald, who had been with the firm since 1873, and retired to Scotland. George Bartlet became the firm's president following Cameron's retirement. Alexander Gow, a native of Guelph, Ontario, was taken into partnership in 1903 and became vice-president of the firm after George Bartlet passed away in 1912. 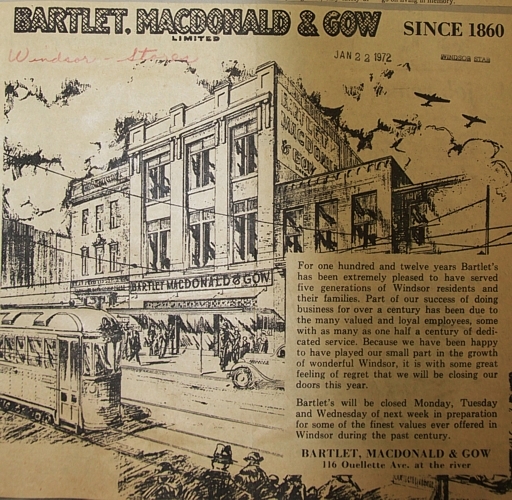 While the store enjoyed continued growth under Bartlet's tutelage, it wasn't until Colin MacDonald took over in 1912 upon Bartlet's death that Bartlet, MacDonald & Gow became the titan of Windsor retailers. "Each one of these [partners] grew up in the store, soaked in its policy, absorbed its atmosphere, made it a part of himself as he made himself a part of it." 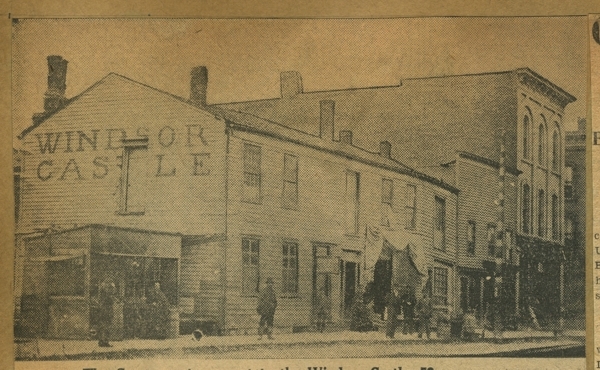 In 1872, the firm occupied the ground floor of the building situated next to the Windsor Castle Hotel on Sandwich Street (Riverside Drive), while the Masonic Temple and private offices used the upper two floors. As the business expanded, the upper floors were taken over, and in 1912 the old Bank Hotel at 23 Sandwich Street East was incorporated into the premises. Four years later, Colin MacDonald invested in a massive expansion, adding another three-storey wing on Ouellette Avenue. 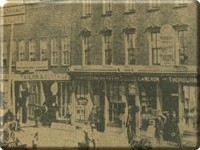 The store now boasted two entrances, one on each of the two principal streets in the city of Windsor. On the top floor, patrons could enjoy a break in the lounge while eyeing the displays of draperies, rugs, and carpets. 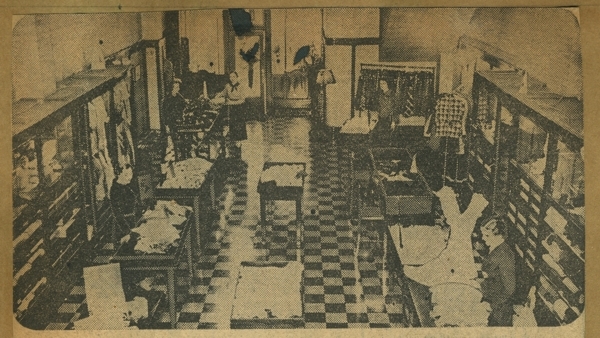 Ladies' and children's clothing filled the second floor, and the ground floor boasted an assortment of specialized departments, including haberdashery, hosiery, and more. 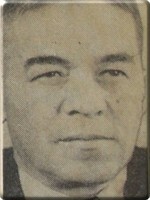 Alexander Gow became company president in 1922 when Colin MacDonald passed away. 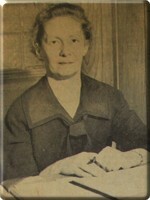 George Fortune MacDonald took over his father's interests and served as secretary-treasurer until Gow himself died in 1928. George was then promoted to president, and James S. Gow, Alexander's son, assumed the position of vice-president and general manager. 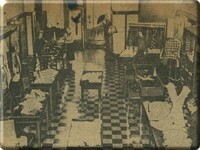 Prior to the remodeling and refitting, interior designers and dry-goods experts surveyed and studied the entire store for its conversion to the exclusive service of dry-goods. Display requirements were different from those of an ordinary department store simply because all departments of a specialized dry-goods store handled fabrics. The result was an arrangement that was rather unique among similar stores at the time. 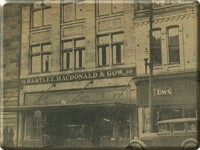 Bartlet, MacDonald & Gow, with its elevators, automatic fire protection, electric clocks, and 4,100 square feet of floor space, earned the distinction of becoming the largest dry-goods store in the Dominion. Secondly, "the fact that all departments handle fabric in some form or another, thus avoiding sharp clashes between any different types of display, has been utilized to create a store layout that is remarkable alike for its simplicity, beauty, and convenience." 3 An open floor plan and deliberate arrangement of displays allowed visitors (who often commented on the store's peculiar sense of "hominess") to survey the stock of the entire floor from the elevator doors. 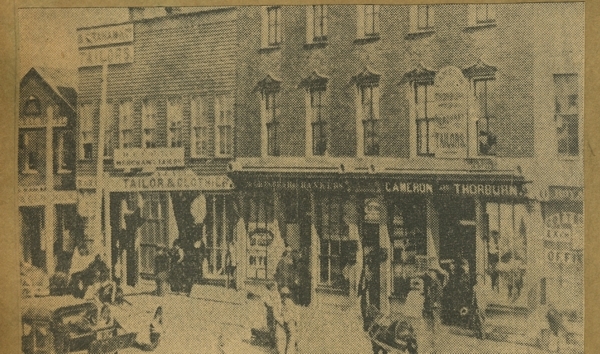 The stock on the ground floor included gloves, hosiery, fine fabrics for dress construction, and everything in menswear from handkerchiefs to tailored suits. On the second floor, customers shopped for ladies' and children's clothing, lingerie, and frequented the millinery department. Carpets, oriental rugs, linoleums, and window treatments filled the third level. 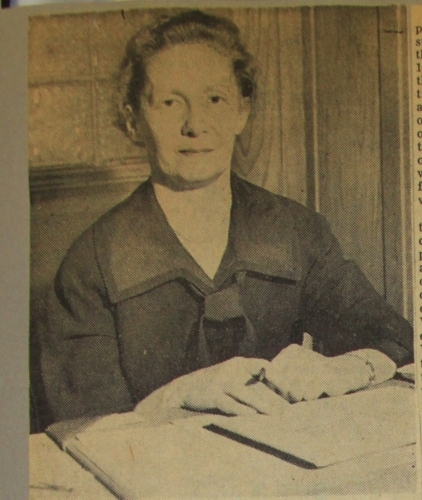 When James Gow was called for service in the Second World War, his wife, Marion, took over his role in the company's administration. When he returned, she acted as assistant treasurer, and became Bartlet, MacDonald & Gow's first female president upon the death of George F. MacDonald in 1959. 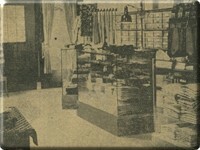 Following in the pattern established by her predecessors, she oversaw an expansion of the store'sinventory just one year into office. 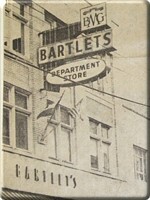 In the fall of 1960 (the 100th anniversary of the store), Bartlet's added two additional departments to its repertoire, one for teen boys and another for teen girls. 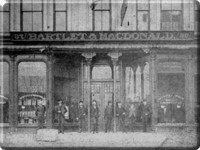 Under Marion Gow's leadership, Bartlet, MacDonald & Gow staffed one hundred fifty employees, a far cry from the pioneer store, which counted just two men - Donald Cameron and John Thorburn - on its payroll. Unfortunately, she also witnessed the store's demise. 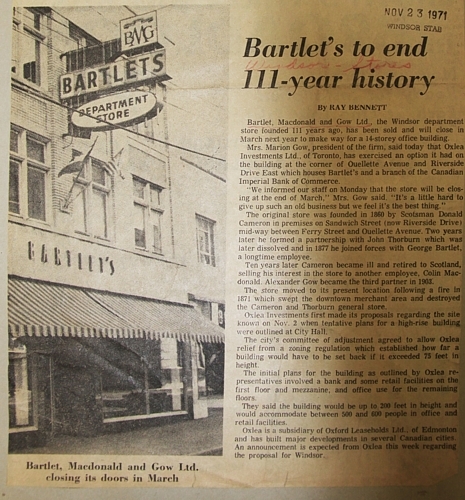 In November 1971, she announced to the staff that the store would close at the end of March in order to make way for a fourteen-storey office building and retail high-rise, thus bringing the store's one hundred twelve-year-old history to a close.